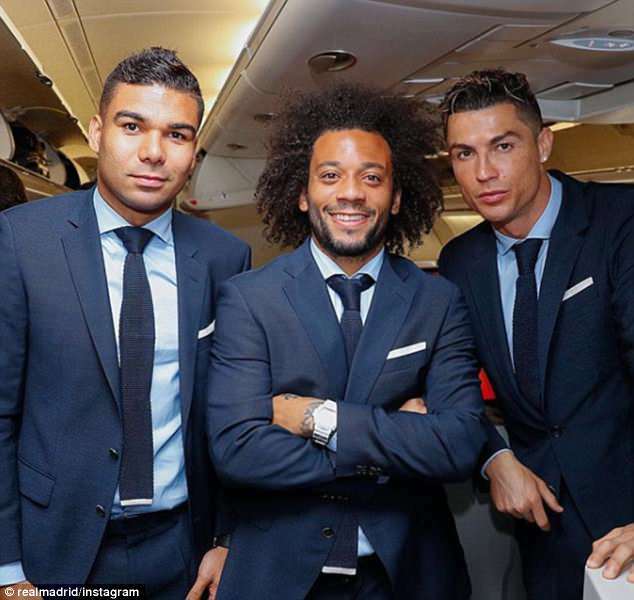 Cristiano Ronaldo and his Real Madrid team-mates made sure they looked the part for their flight to Munich on Tuesday as they prepare for the biggest test of their Champions League credentials so far this season. Zinedine Zidane’s men face Bayern Munich in the first leg of their semi-final on Wednesday night as they attempt to win the competition for a third straight year. The squad were suited and booted for their morning flight to Germany, with Ronaldo leading the way for the Spanish giants. Zinedine Zidane has called up his entire 24-man squad for the crunch clash at the Allianz Arena, with president Florentino Perez also on board the flight. Ronaldo was all smiles alongside Brazilian duo Casemiro and Marcelo, while No 1 Keylor Navas was pictured looking smooth in a pair of sunglasses as he made his way onto Real’s team plane. Midfielder Toni Kroos cut a relaxed figure as he posed for a photo after taking his seat for the two-and-a-half-hour flight to Germany. Zidane, meanwhile, has admitted that Karim Benzema is stuck in a rut, having managed just nine goals in 39 appearances this season. ‘I see him the same as always, the only thing is that he himself is going through a bit of a rough time because of all the things being said about him,’ Zidane said ahead of Wednesday’s first leg. ‘He would like to score more goals, but he is working well in training, he is always there with his team-mates and he is focused.